Do you like a little kick in your food? A tasty heat, a quick zip, a bit of pizzazz? I'm not sure you would jump to think of Guam first when you're seeking some spiciness but maybe you should. 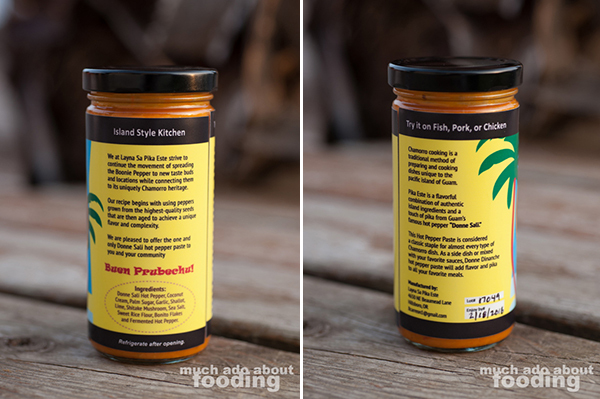 The husband-wife duo over at Layna Sa Pika Este recently reached out to us about an intriguing product of theirs which uses a hard-to-find and hard-to-grow pepper: their traditional donne dinanche hot pepper paste. Though the creators operate just outside of Portland in Oregon, their inspiration comes from their roots (or as the husband, Jorge, claims, he is "chamorro by marriage") and that type of inspiration begets authenticity. We were excited to see what this pepper paste was all about and how we could incorporate it into our own meals. The basis of the paste is the Boonie Pepper of Guam which is hard to find on the mainland, a fact we could believe as we and others hadn't heard of it before. After what seemed like endless attempts at growing the plant itself in Oregon, the couple were able to finally get some going at a rate that made it possible to begin offering live plants, peppers, and pepper paste to their community. We got a lovely 8oz. jar to try as well as some infused sea salt to perk up some dishes. I asked what the creators like to use the paste on in particular, and they shared their favorite: a dipping sauce called finadene composed of soy sauce, cane vinegar, diced onions, and a dab of the dinanche. Additionally, others have found success in mixing it into spicy poke bowls, congee, Thai curries, pho, smoked sausage, riblets, and empanadas. 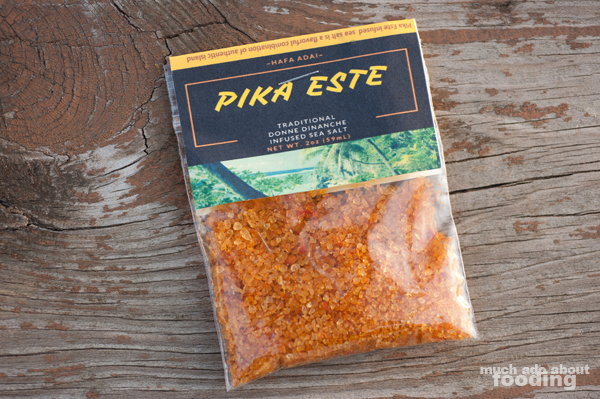 Traditionally, the paste in Guam is used in dipping for primarily BBQ meat but also shrimp patties, lumpia, dried beef, and more. The possibilities seemed as endless as many other hot sauces but the key difference in this paste versus other pepper pastes seemed to be the island influence. Specifically, coconut cream plays a big role in the base of this paste. We noticed it right away when we opened the jar of it and then tasted it. The coconut cream mellows the heat out just a touch. Don't get me wrong - it still is quite spicy in its own right but the cream helps. It also gives a different aftertaste than most pepper pastes because of the lingering nature of coconut cream. Garlic, shiitake mushroom, and bonito are also ingredients in the paste whose inherent umami traits shine through. I knew that to use this, we'd need to play along with those particularities. The first approach was to brush it all over a large pork roast I was putting in the oven one night. The paste seeped into the meat beautifully and actually caramelized a little, likely because of the palm sugar. That left a sweet-and-spicy crust on the roast along with the coconut-y aftertaste. Next, I combined some paste with soy sauce, garlic, brown sugar, and rice wine to saute Japanese mustard greens - it played well with the brown sugar to cut through the mustard's bitterness while contributing a lingering heat. Predominantly, we've been brushing it onto slices of pork belly we roast so it melts into the fat and caramelizes around the meaty sections for a tasty crust. That pork belly then either becomes a part of a variety of tacos or mixed into braised greens. I'm excited to see what more we can use it for, seeing as little goes a long way. Its coconut undertone makes it a fantastic fit for Asian dishes overall. We are by no means hotheads/pepper seekers but the uniqueness of this particular paste had us curious and it all came down to one little pepper: the Boonie Pepper, or Donne Sali as it is known on Guam. Small, bright red, and quite pungent, it is a powerhouse packed into an unassuming size and shape. 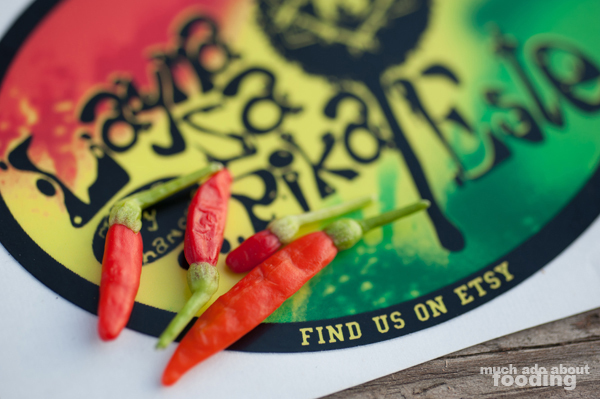 Grown since the time of Spanish arrival on Mariana Island, the pepper's spread and cultivation are told through a legend that said the Sali (local birds) took the seeds to nearby islands after feeding on them. 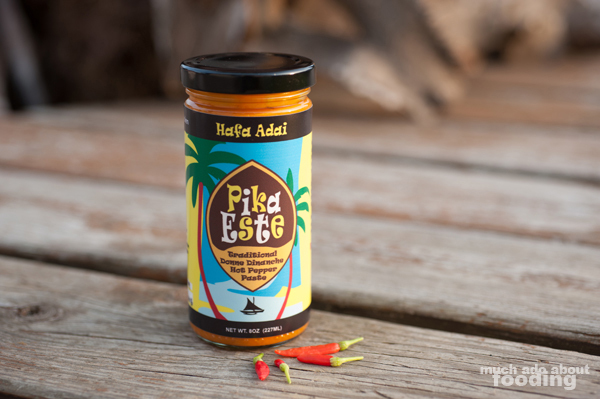 Layna Sa Pika Este wants to continue this spreading of the pepper by building their many products out with strong, unique recipes built from high quality ingredients. 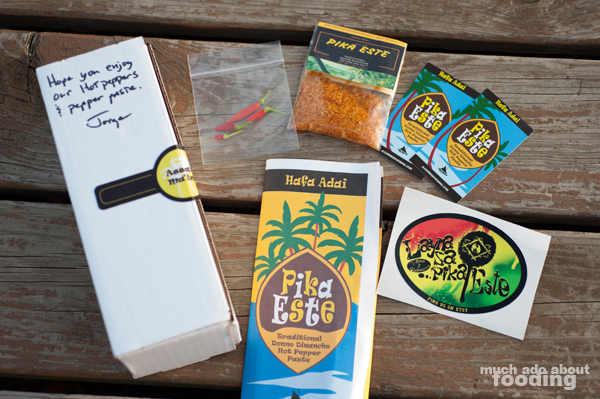 Having had their flavorful and versatile paste now, we can see that this spin on pepper pastes could definitely gain some ground, especially for those who want some island flair to their heat.